Two master bedroom suites were designed with privacy in mind. 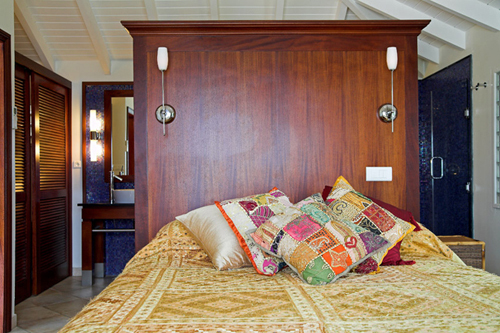 The combination headboard / armoire, separate the bedroom area from the open bathroom. Beds face the sea to welcome the morning view. Queen size, American made bedding, down pillows and fine linens, in both suites. Incandescent lights shine on the luxurious bedding and offers a serene nights sleep.